CERES, Calif.--(BUSINESS WIRE)--Jul. 13, 2018-- KB Home (NYSE: KBH) today announced the grand opening of Orchard Terrace in Ceres, an intimate enclave of new homes located less than a mile away from the enchanting Strawberry Fields Park. Convenient to California State Route 99 and Morgan Road, Orchard Terrace is close to major area employers, including Kaiser Permanente, Del Monte Foods and E & J Gallo Winery. Residents of Orchard Terrace can enjoy the rich history of dynamic Downtown Modesto, which features a number of notable buildings, including the McHenry Mansion and the Gallo Center for the Arts, as well as a wide selection of dining and entertainment destinations. Nearby Tuolumne River Regional Park provides over five hundred acres of parkland, bicycle trails and a golf course, and the 76-acre Ceres River Bluff Regional Park offers several sport courts and fields. KB Home will host a grand opening celebration at Orchard Terrace on Saturday, July 14, from 11:00 a.m. to 2:00 p.m., during which attendees may tour the elegantly appointed model homes. 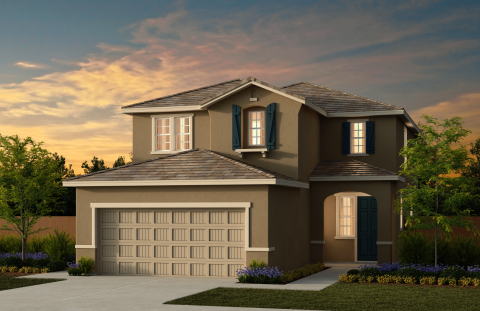 At Orchard Terrace, KB homebuyers may choose from three two-story home designs that range in size from 1,700 to 2,200 square feet and include up to four bedrooms and two-and-a-half baths. Spacious two-car garages, ample storage and large master suites are characteristic of all the homes at Orchard Terrace. Pricing begins in the low-$300,000s. As part of KB Home’s distinct homebuilding process, buyers may personalize many aspects of their new home to suit their budget and preferences. After selecting their lot and floorplan, KB homebuyers can work with expert design consultants at the KB Home Design Studio, a retail-like showroom, where they can select from a plethora of design and décor choices, including countertops, cabinets, lighting, appliances and window coverings. The KB homes at Orchard Terrace will be built to current ENERGY STAR® guidelines and include WaterSense® labeled faucets and fixtures, meaning they are designed to be more energy- and water-efficient than most typical new and resale homes available in the area. These energy- and water-saving features are estimated to save homebuyers between $1,572 to $1,752 a year in utility costs, depending on floor plan. The Orchard Terrace sales office is located at 909 Amanecer Drive in Ceres. The sales office is open Thursdays through Tuesdays from 10:00 a.m. to 6:00 p.m., and on Wednesdays from 2:00 p.m. to 6:00 p.m. For more information about the KB homes at Orchard Terrace or KB Home’s other new home neighborhoods, visit www.kbhome.com or call 888-KB-HOMES. KB Home (NYSE: KBH) is one of the largest homebuilders in the United States, with more than 600,000 homes delivered since our founding in 1957. We operate in 35 markets in seven states, primarily serving first-time and first move-up homebuyers, as well as active adults. We are differentiated in offering customers the ability to personalize what they value most in their home, from choosing their lot, floor plan, and exterior, to selecting design and décor choices in our KB Home Studios. In addition, we are an industry leader in sustainability, building innovative and highly energy- and water-efficient homes. We invite you to learn more about KB Home by visiting www.kbhome.com, calling 888-KB-HOMES, or connecting with us on Facebook.com/KBHome or Twitter.com/KBHome.